Sri Lanka Cricket was able to ensure that the television footage of Vernon Philander's ball-tampering was aired 48 hours after the incident took place. In the interim period, it has been established that the Ten Sports producers were under pressure by the South African team not to have the footage shown in their broadcast. CSA have declined to comment on the incident. In the TV footage that finally appeared during the closing stages of the Galle Test, Philander was seen scratching the ball with his fingers and thumb in the afternoon session of the third day. Philander dug his nails into the rough side of the ball at least twice and was also seen covering the ball with one hand while picking at it with the other. At the time of the incident, the pictures were only viewed by the Ten Sports production team and match officials. Ten Sports showed the pictures on day five at the end of the 69th over, shortly after the second session drinks break - within 20 minutes of an SLC official visiting the production team at the ground and making it clear they wanted the pictures broadcast. It followed almost two days of pressure by CSA and the South Africa team management on the TV producers to not air the footage as it could "create a negative image" of their team. When the television cameras had picked up images of Philander picking on the ball, they did not air the footage but alerted the ICC match referee Jeff Crowe, who viewed the footage at tea time. No message was sent to the on-field officials until the incident was reviewed after the day's play. Philander was then charged, pleaded guilty and was fined but the pictures were not shown at all. A source in the know of the incident said, "CSA big-wigs made it clear they would not be happy if we showed the incident." Not broadcasting the pictures at the time of the incident also prevented the third umpire from viewing the footage, and precluded the possibility the third umpire would interrupt play as soon as evidence of ball-tampering emerged. 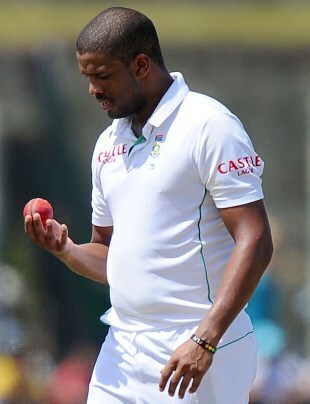 As it transpired, South Africa used the ball Philander had tampered with till late in the evening session. Sri Lanka captain Angelo Mathews said after the match that the ball had reverse-swung more on the third evening, than at a comparable stage of the innings on day five. Crowe was the only match official aware of the tampering before the close of play, but he is not allowed to present the footage he viewed to the umpires, while play is ongoing. All five match officials viewed the footage after stumps on day three, at which point the umpires laid the charge against Philander. SLC may have acted sooner, but were unaware of the pressure being placed by CSA until Sunday. When officials from the home side heard of the directive sent out to the producers, they insisted that Ten Sports show the footage and the producers had no choice but to relent. Ten Sports are broadcasting this series under SLC's purview, as part of the $60 million deal the broadcast company had signed with the board, for coverage up to 2020. This is not the first skirmish between CSA and Ten Sports, which owns rights to broadcast South African cricket outside of South Africa on a basis of a R1.5 billion (US$150 million) contract. Ten Sports also held the rights for Pakistan cricket during South Africa's tour of the UAE last October-November when Faf du Plessis was caught on camera rubbing the ball near the zipper on his trouser pocket. The television umpire alerted the on-field officials who awarded five penalty runs to Pakistan and changed the ball. Du Plessis was later fined 50% of his match fee after pleading guilty to ball tampering. At the time, CSA responded furiously at Ten Sports' coverage, one insider saying, "They (CSA) told us they would take away our rights and threatened to deny us player interviews in the future," an insider said. Sri Lanka have not made any other big noises about the ball-tampering incident except to say they would like to see the umpires take stronger action. "It's unfortunate when someone tampers with the ball. If they tamper with the ball, they get the better of it. I think the umpires need to make sure it doesn't happen again," Mathews said. Asked if he felt his side was cheated, Mathews was careful. "It's not within the laws. You can't tamper with the ball. It's the umpires' decision and they need to make sure it doesn't happen again." He also noted there was more reverse swing on the third afternoon than there was on the final day. South Africa have tried to play down the incident. Dale Steyn's first answer to whether the ball-tampering fine blighted the victory was, "I don't really think about that," and he followed it up with, "I think tomorrow morning in the papers it will say that we won this game regardless, so I don't know what to say about that," he said.